Fascinating. How do you know their mechanism is an automated market maker? Do you have any information on what underlying scoring rules (or other things of that nature) they use? I read the Yahoo! article, and it does indeed say that there is some statistical algorithm running in the background, but do you have any more technical information than that? Thanks. Thanks Mike. It’s an automated market maker in the sense that it’s always providing odds on both sides of multiple outcomes, and constantly updating them based on the game (intelligent prior) and what other people have bet so far. I have no idea what scoring rule if any they are using or the nature of their algorithm. Yahoo! Predictalot is using an approximate version of Hanson’s logarithmic market scoring rules market maker. Our dynamic prior is pretty simple: based on the strength of teams and the current score of the game. Cantor, dealing with real money, must have a much more sophisticated prior in their “Midas” algorithm, as alluded to in the Wired article. What is the take out for in game betting applied by Cantor? Not sure if it’s the same Cantor device but I believe they have the same thing at the Palazzo as well. @Eric P: Not sure. You could compute it by summing the odds of two opposite bets: next time I go I’ll try. I suspect it’s close to the typical 5% vig. I haven’t used the device, but I like the fact that it has influenced other books in town. 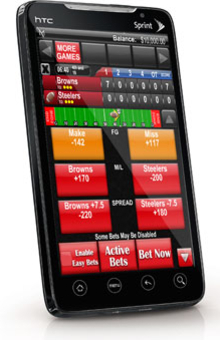 Many now have in game wagering, albeit without the device. During breaks they post “in-game” odds that stay up for a few minutes. Makes watching the games in the books that much better, as a player seeks value even as he’s enjoying the game. And lest we forget, the goal of a book is not to predict the outcome as much as to get the proper amount of action on either side of a bet. Then their vig is in the bank.